Dubai, United Arab Emirates – 23 January 2019: Lenovo Data Center Group (DCG), a global technology leader, today announced their first participation in Intersec 2019, one of the world’s leading security trade shows, hosted at the Dubai World Trade Centre. During the exhibition, Lenovo DCG is showcasing some of the company’s high-performance computing capabilities, as well as an extensive product offering designed for the ‘Intelligence Revolution’ era. In line with Lenovo’s strategy to empower and facilitate ‘Intelligent Transformation’, the participation follows the company’s recent announcement of entering a strategic partnership with Pivot3, a leading provider of intelligent infrastructure solutions, to develop, market and sell a new set of converged computing and storage solutions optimized for mission-critical smart city security applications. The integrated appliances feature Lenovo DCG’s ultra-reliable ThinkSystem servers and are powered by Pivot3 HCI software. As cities around the world compete for the title of the smartest and safest city, much of the market growth is being driven by mission-critical security initiatives that rely on information collated from an array of city sensors and databases combined with video data and analytics, including facial recognition, behavioural analysis, license plate recognition and many others. Effectively collecting, analysing, storing and acting on all this information in real-time is dependent on the capabilities of the latest advances in reliable, efficient and always-available computing and storage solutions. “Through our partnership with Pivot3, we provide a solution for our customers to centrally manage both their core datacentre and distributed edge devices with faster video ingest rates, higher resilience and smaller, space conscious appliances. Together, we are enabling the next generation of computing in the core, the edge and the cloud for governments and organizations that will better protect people and the society at large, leveraging the very latest advances in machine learning and analytics,” Chris continued. The new Lenovo DCG/Pivot3 solution is currently available and already successfully installed in the Middle East and markets across the globe with leading retail, hospitality and regional governmental customers. Proof-of-concept testing is also available at Lenovo’s Innovation Centres, where customers can gain real-time insight into how the IoT solutions can respond to individual environments, workloads and data. 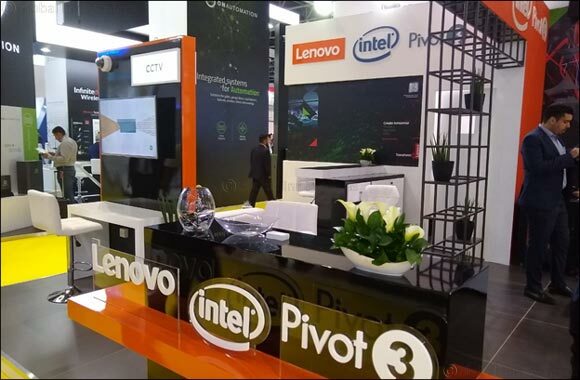 An example of Lenovo DCG’s and Pivot3’s growing customer portfolio is Bogotá, Colombia. The city had to refresh its complex monitoring system that comprises over 1,000 cameras from different vendors. The South American city is one of the major cities that are now deploying a highly-efficient Lenovo DCG/Pivot3 solution to achieve maximum infrastructure efficiency and federate the entire security network into a central control centre. Following the success of the project, many of Bogotá’s suburbs have opted for the deployment of a similar monitoring system, adding another 2,000 cameras that are spread across the city's 18 boroughs.